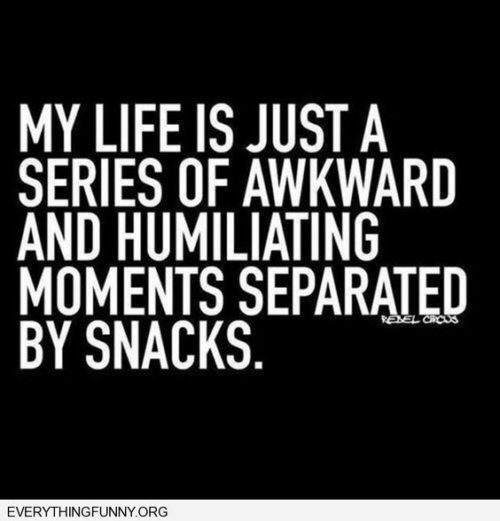 We have all been there, and this image speaks truth, life is a series of awkward moments. Of course, some days are more awkward than others. Not only that, but these moments are also separated by sleep, as well. Question: How often do you find yourself remembering something goofy you did in the past? As for me, all the time, lol. Don’t be an awkward sap, follow us on Facebook and Friendslr and Twitter for new stuff nearly every day! Or, right here on Laughshop.com, or course. Shoot, we’re so old we even have a MySpace page!